Was Branch Rickey the Father of Sabermetrics? Branch Rickey was always considered to be a man well ahead of his time. The former GM of the Cardinals, Dodgers and Pirates is best known for being an instrumental figure in breaking baseball’s color barrier, but he is also credited with such innovations as developing the minor league farm system and pioneering advancements in equipment. And now, perhaps to the consternation of modern day purists, it appears as if he was also the father of sabermetrics. Over the weekend, The Good Phight, a Phillies blog on the SB*Nation network, featured intriguing excerpts from a LIFE magazine article about Rickey’s statistical proclivities (“Goodby to Some Old Baseball Ideas”, published on August 2, 1954). The Good Phight does an excellent job juxtaposing some modern examples of reactionary baseball thinking against the lucid, progressive thoughts of Rickey that were uttered over 50 years ago. Apparently, the same resistance to change that existed in Rickey’s era continues to this day. I guess the more things change, they really do stay the same. That Rickey was involved in advanced statistical analysis isn’t surprising. As the LIFE article mentions, he was widely regarded as “the first executive to see the value of using baseball statistics in putting together and running his teams”. While GM of the Brooklyn Dodgers, this realization inspired Rickey to hire a full-time statistician named Allan Roth in 1947. Only 26 years old at the time, the Montreal-born Roth was charged with recording every conceivable piece of data pertaining to the team and then synthesizing it into relevant strategy. 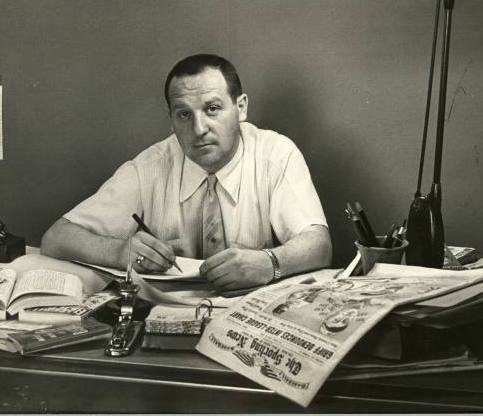 Rickey hired Allan Roth as a fulltime statistician in 1947 (Photo: Life). Based on Roth’s findings, Rickey began to espouse ideas that were revolutionary in baseball circles. The most profound was probably the notion that a player’s performance was impacted by (left hand and right hand) splits, but Rickey was also one of the first of his era to vocally suggest that metrics such as batting average and fielding percentage were highly overrated, and in some instances, meaningless. Such statements cause resentment even today, so just imagine how Rickey’s contemporaries must have felt? Interestingly, Rickey’s statistical revolution not only impacted his own industry, but it left a mark on the publishing realm as well. Just in time for the 1949 season, a newspaper called the Daily Baseball Form was launched. Much like today’s fantasy baseball-inspired websites, such as Baseball Prospectus and Fangraphs, the new publication was geared toward those inclined to place a wager, but its volume of statistics eventually made it a universal resource. We’ve gone off the beaten path a bit, but let’s jump back to the LIFE article. As we’ve established, there really is nothing surprising about the idea that Rickey was an early day sabermetrician. In fact, the most astounding thing is how little so many associated with the game have evolved. Having said that, the level of sophistication revealed in the article is certainly eye opening. Branch Rickey explains his formula (Photo: Life). What stands out most about the article is Rickey’s formula, which makes sense considering the large photo featuring a complex series of numbers scrawled across a blackboard. It would be enough to simply marvel at the length to which Rickey had gone to calculate such a comprehensive statistic, but upon a close examination, it seems as if the formula is much more than a quaint precursor of the modern sabermetric revolution. Rather, encoded in Rickey’s calculation are some fundamental tenets of today’s most reliable metrics. The first part of the formula, which represents On Base Percentage, isn’t particularly ground breaking. Although Rickey’s era was dominated by regard for batting average, the value of OBP was well understood at the time. After all, a 1933 column by John Lardner refers to the “ancient ivory adage: a walk is as good as a hit”, so appreciation for bases on balls has long been a part of the game (for the record, Rickey believed a walk was 75% as good as a hit during his era). The second part of equation, however, is very interesting. It begins with the formula for isolated power (ISO), which is a modern sabermetric staple. Incredibly, not only was Rickey using the calculation in 1954, but he was calling it by the very same name. I wonder how many people who use the figure realize it was invented by a man born in 1881? Rickey doesn’t simply stop at refining slugging percentage by calculating ISO. Instead, he employs another widely accepted sabermetric tenet: OBP is more important than SLG. 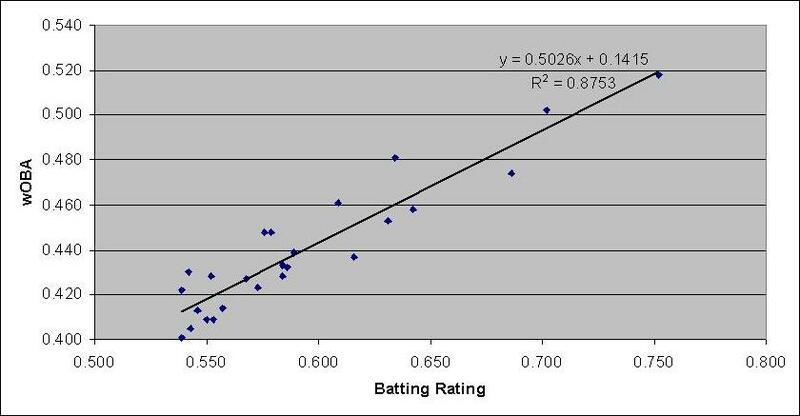 To achieve this, Rickey determined that ISO wasn’t as effective as OBP in terms of how well each figure correlated to runs scored, so he assigned a coefficient of three-quarters to the calculation. By combining a weighted derivation of SLG with OBP, Rickey not only invented a precursor to OPS, but his version was actually much better. Rickey’s third ratio is used to determine the percentage of a team’s base runners that wind up scoring. Called “clutch” by the Hall of Fame executive, the calculation is team dependent, so it is removed from the evaluation of individual players. Beyond the formulas and the juicy quotes, the most intriguing part of the article is a chart in which Rickey uses his formula to rank the best offensive performers from 1920 to 1953 (the year before the article was written). Upon seeing the list, my initial reaction was, “what better way to test Rickey’s formula than by comparing it to the best metrics that available today”? So, without further ado, provided below is a list containing Rickey’s top-20 batters ranked by both his own “Batting Rating” and wOBA. Note: Based on stats from 1920 to 1953. Although there are some notable differences, the two rankings seem to be in agreement with each other. In fact, all but five of Rickey’s top-20 also appeared in the wOBA ranking, and of that group, none finished lower than 42, which isn’t too significant when you consider the relatively small differences in the actual figures. Even more impressively, when compared to each other, the data sets exhibited a correlation coefficient of .94, which suggests the two metrics are very closely aligned. The article also addresses pitching, but Rickey conceded that the offensive side of the equation was much easier to figure because the defensive side was complicated by the difficulty in quantifying fielding. Even with modern day video equipment and FieldFX technology, the development of a reasonably accurate fielding scale remains elusive, so the limitations faced by Rickey were insurmountable at the time. As a result, there isn’t much basis for comparing Rickey’s formula to a modern equivalent. So, was Branch Rickey really the father of sabermetrics? Honestly, it doesn’t seem fair to give anyone that much credit. From Henry Chadwick to Rickey to Bill James to the many bright minds crunching numbers today, baseball has always been a game in which statistics have figured front and center. Ironically, those who shun this lineage are actually turning their back on one of baseball’s oldest traditions. Then again, if the proliferation of statistics is one of the game’s most enduring historical trends, deriding them is probably a close second! Nice piece…..Rickey was no doubt a genius….and he managed to get 10% of the sale price for each of his farm hands. It was not Rickey who was the father of sabremetrics, but the statistician Allan Roth who came to him with the ideas.